Oh-so smooth with notes of sweet black raspberry, ripe cherry, black currant and purple plum with hints of floral like lavender and violets. 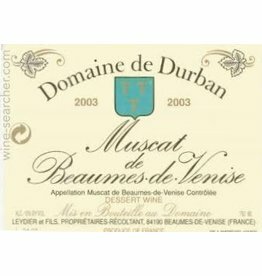 The Leydiers are particularly proud of their Muscat de Beaumes-de-Venise, a vin doux naturel, as they are among the last to craft it in the traditional style. This dessert wine displays concentrated notes of ripe pear and apricot.